The Royal Palace of Berlin was founded in 1443, as the residence of the Hohenzollern Dynasty. The Palace was at first a fortress (Zwing Cölln) for 200 years. It later became a palace in the style of the renaissance architecture. Frederich II founded and constructed the commission of the Castle ‘Zwing Cölln’. The castle was situated on the banks of the Spree River in the Cölln section of the sister town of Old Berlin. A portion of the Cölln city wall was integrated into the building on its eastern side. From this location the ruling Hohenzollern family could control the trade route, of which lead to the ‘Berlin displeasure’, an uprising during which Berliners resisted the castle and the control through flooding the site by opening locks on the River Spree. The matter was eventually solved due to overwhelming need for each other. The palace became the permanent residence of the Hohenzollerns. In place of the castle arose a splendid renaissance palace. The palace became the center of the court and state government, as well as the center of Berlin upper class social life. Due to the 30 year war the palace became rather dilapidated however, the palace was restored back to its former glory. The place ceased being the margin of the city and became the core due to Johann Moritz von Nassau-Siegen of whom laid out a series of arteries with the Place at the center. One of the arteries was the boulevard Under den Linden of which was connected to the palace via the Hunderbrücke. Under the rule of Friedrich III King of Prussia, the most extensive and important renovations and enlargements of the palace were carried out. Friedrich brought in Mark of Brandenburg to bring to pander to his need for splendor. This resulted in a lack of money to engage in warfare. He preferred to dedicate his money in the finance arts and sciences. Therefore, under his rein the academies of science and the arts were founded in Berlin. Charlottenburg palace was built in Lietzenburg ad a summer residence for his wife Sophie Charlotte. Andreas Schlüter, the most important German baroque architect was chosen to be the chief architect of the palace in 1699. He set about converting the renaissance palace into the most splendid baroque residence in all of Germany. In 1701, the King moved into the new palace. The magnificent rebuilding of the place was intended to show of the power of the new Prussian kingdom. The key model for the palace was the Italian baroque; the windows were adapted from those of the Palazzo Madama in Rome. Johann Eosander von Gothe became the palaces chief architect. He was heavily influenced by monumentailsm there he doubled the size of the palace with an extension to the West. However, the work was not completed due to death of the King in 1713. The King left behind an almost bankrupt state. The new King Fredrich Wilhelm I, in spite of his thriftiness permitted the completion of the palace but without the elaborately decorated interior. It was completed on the third year of Fredrich Wilhelm’s reign by Eosander’s successor Martin Heinrich Böhme, a student of Schlüter. King Friedrich the Great moved his center of actives from the Berlin palace of which he hated to Postdam and the palace of Sanssouci. Therefore, only the carnival ball and the great winter soirees took place in the palace. King Friedrich Wilhelm II during his short reign installed some of the most beautiful royal apartments in the palace. The king disliked the view down Unter den Linden west to the Tiergarten Park so gave Langhan the task of creating a gate to the palace. 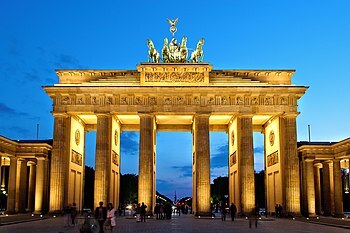 Langhans studied the Propylarn in Athens, interpreted it and constructed a great gateway at the end of the boulevard of which was the Brandenburg Gate. Originally, it was painted white to give the impression of white marble but after it renovations it was converted back to sandstone. It is to this day one of the most important architectural symbols of Berlin and indeed Germany. The revolution in Germany forced the King to abdicate on November 9th. The palace became occupied by workers and soldiers. On the Holy evening, the army was sent against the revolutionaries of whom many died. Karl Liebknecht proclaimed the socialist German Republic on November 9th however, Scheidemann had already in the Reichstag proclaimed a republic, so Liebknechts proclamation came to nothing. During the First World War the area around the palace became the scene of many demonstration of which were quite militant. There was an interregnum in the palace where it was no longer used by the state as the Weimar republic had moved it headquarters to the west in Wilhelmstrasse in the Schwerin palace. During the Third Reich, the national socialists avoided the palace for their event, even though they used the Pleasure Garden for frequent parades. For the 1936 Olympic games the Olympic torch burned in front of the palace surrounded by the flags of the participating nations. The first severe bomb attack that damaged the palace. The palace burns for four consecutive days due to heavy bombing. There were no attempts to put out the fire due to the years of air raids the Berliners were resigned it fate. 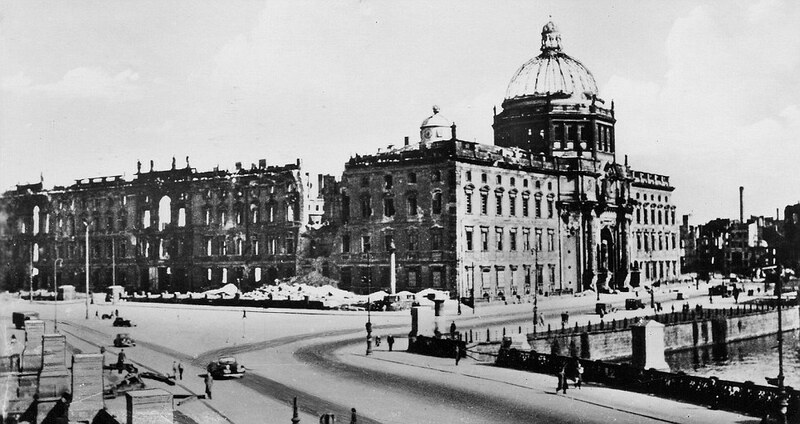 During the Battle of Berlin the palaces façade suffered further artillery fire. 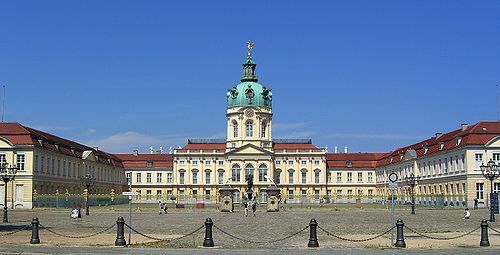 The palace was stood well in its basic substance as the Charlottenburg palace suffered more damages, of which today shows none of its wartime damage. Hans Scharoun draws up a cost plan for the securing of the palace ruins. In November Berlin is split. Friedrich Ebert, the son of the first President of the Weimar Republic becomes the mayor of East Berlin, of which power he used to strongly oppose any attempt to reconstruct the palace. Consequently, the palace was cordoned off supposedly because it was deemed liable of collapsing. The SED (German East Communist Party) wins the upper hand in the East under the protection of the Soviets, thus resulting in the end of the 500 years worth of history of the palace. The SED politicians increase there subtle attacks saying the palace is flimsy and demand its removal. The palace was demolished by the orders of SED Chairman Walter Ulbricht. The process of the demolishment goes on for almost 6 months. In place of the palace arose the Marx-Engels Platz that had a huge grandstand in the East of which the German Democratic Republic used for enormous demonstrations and marches. Following the diplomatic recognition of East Germany the Palace of the Republic (House/Palace of the People) is recected on one side of the giant square of Marx-Engels Platz. It became the central show place of the German Democratic Republic for major political and cultural events. The building skeleton was constructed of steel to protect against fire, but the steel was coated in 5,000 tones of asbestos. The Palace of the republic was closed due to the high degree of asbestos contamination. This year marked the beginning of discussions concerning the rebuilding of the Old Palace. The intensity of these discussions grew with the solidification of post communist Berlin and led to the final vote in the German Bundestag. The Senate of Berlin and the Federal government announce the International Spree Island competition in an aid to determine the structure of Berlin’s center. In total over 1,000 architects tool part. The three winning designs included the square form of the Palace once again. The residing jury decided that the Palace of the Republic should be demolished because of it was deemed to wrongly conceive the urban planning standpoint they wanted to achieve. The commissions of the removal of the asbestos from the Palace of the Republic took place. A survey carried out by the Forsa Institute found that among the Berliners that many more inhabitants vote for the rebuilding of the original palace than for the construction of a new building in a modern style. 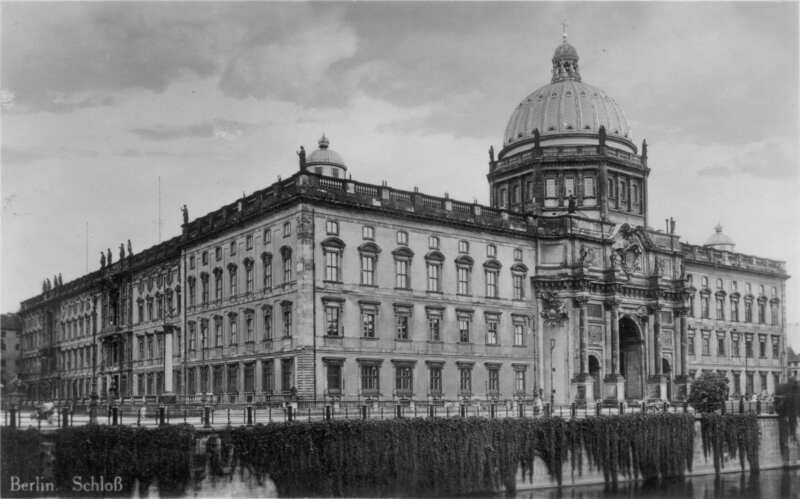 In July, the German Bundestag decides by an overwhelming majority in favor of the rebuilding of the Berlin Palace. 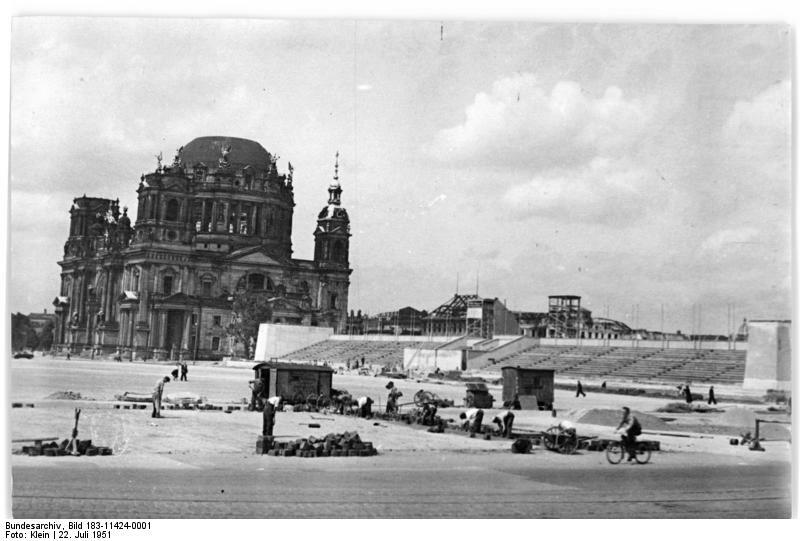 The Palace of the republic was demolished after a controversial debate regarding this construction and its significance in Berlin’s history. The site where the Palace of the Republic once stood in Berlin. Our century as former centuries has its fierce orthodoxs and fierce heretics. Try to suggest to a modern architect that the reconstruction of the main prestigious and most beautiful rooms of the former palace could be included in their projects and not out of place, and also expected and fully enjoyed by visitors, and you will see these modern architects suddenly panic, empty themselves of their blood and swear that they would never consider such a scandalous heresy. That idea seems to me not less incongruous that making the reconstructed palace the site of African arts. Decorative German atr would seem more conform to the site. If at any rate they would argue of the lack of funds, could not they recreate the volume of the most prestigious rooms of the past give them a contemporary use, and leave to further generations the task of redecorating as they were before the war? I am afraid that even such a reasonable solution may not get the approval of our terrified architects.